“FILTER CONCEPT”, a leading manufacturer and exporter of industrial Filters, is now offering Coalescing Filters. To understand the importance of these filters, we must understand about coalescence. Coalescing is a process of separation, used by the Process Industry for liquid – liquid separation and liquid – gas separation. This process involves the coalescing (joining) of small particles or droplets of water in to larger one by means of barrier or electrical energy. When mixture of two different liquids, or Liquid – gas forms are outcome of any of process, as an example Oil and Gas refinery process, which are un soluble to one another and forms an emulsion suspension, in such application fluid, the dispersed fluid forms droplets during the process. During coalescing, these no. of tiny droplets come together to form a bigger droplet. These bigger droplets can be formed through attraction of microscopic water or liquid dewdrops. The dewdrops come together by the force of molecular attraction and surface tension. When they reach to a sufficient bigger size to be fallen downward due to gravity, they are collected at bottom side arrangement and removed through suitable means. Density difference of both fluids play an important part to cause droplets to rise or fall by their buoyancy. Submicron droplets flow around the target. Droplet strike the target and adhere. No. of droplets coalesce and forming the larger drop. Trickle down and fall, separation of drop. Electrostatic Coalescer : An electrostatic coalescer uses weak electric charges to attract molecules of water to the surface where they undergo collection. Mechanical Coalescer : A mechanical coalescer, in which FCPL deals, is made up of fine mesh, fiber glass media or Nonwoven Polyester / Polypropylene with oil and water repellency in pleated or wrap round configuration. The liquid or vapor passes through the filters where the water droplets are intercepted by the fibers. 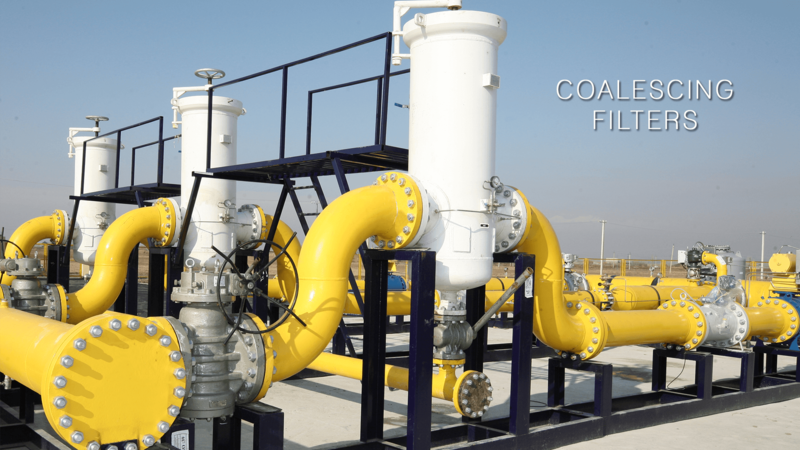 These filters can be used for liquid – liquid separation and liquid – gas separation. Liquid – liquid coalescer is used for separation of hydro carbon from water, like oil removal from produced water, water removal from aviation fuel, gasoline, diesel etc. Liquid – gas coalescer is widely useful to remove water and hydro carbons from natural gas. Oleo phobic Media: Which is useful to remove oil and hydro carbon content from application. 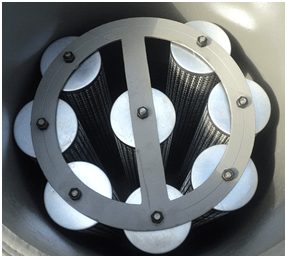 Selected Filter Media can be arranged in wrap round or pleated configuration as per optimum filtration area requirement to form the Coalescer filter element. Flow of application fluid passes from out side to inside direction through the coalescer. The droplets coalesces and collected at bottom of filter housing, which can be drained out through the drain arrangement.